Since Agile innovation methods revolutionised the IT landscape almost three decades ago, the methodology has slowly spread into other business disciplines, from HR strategies to marketing. The Harvard Business Review lists improved quality and speed to market, boosted motivation and increased productivity levels of IT teams as key success factors of the Agile Methodology. The question becomes: how can these same success factors be applied to other departments? Consider the possibilities. What if an organisation could achieve positive returns with 60% more of its new products? What if marketing programmes could generate 40% more leads? 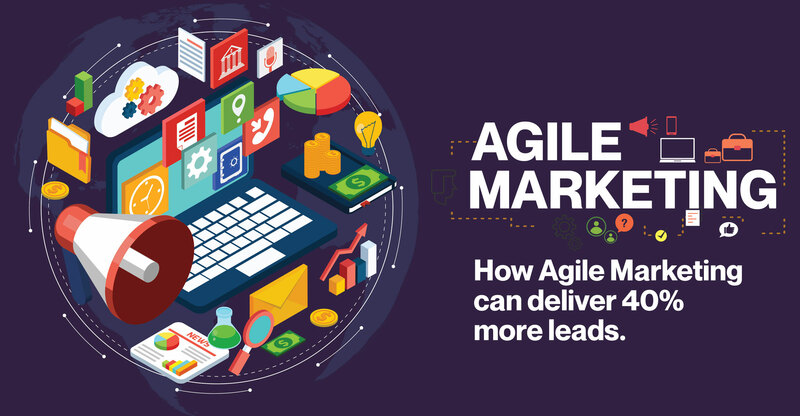 Since lead generation should be the ultimate endgame of all marketing activities, Agile Marketing offers an unprecedented opportunity to maximise marketing ROI and drive results. Here’s the reality of the technology landscape: innovative technologies are launched faster than anyone can forecast, making it almost impossible to determine what new trends could emerge during a campaign or, worse, before you even manage to launch. How familiar does this scenario sound: a telecommunications company wants to see how customers will respond to a new e-mail offer. Step one is compiling a mailing list, followed by writing the copy, designing the mail, iterating both, checking the list, copy and design with legal multiple times, and then sending everything for approvals. Eight weeks later, the marketing team is ready to launch its new e-mail offer. In a world where you have only seconds to capture a browser’s attention, spending eight weeks on a mailer borders irrelevance, particularly in the digital and tech space. The solution is an Agile Marketing campaign. The Harvard Business Review recommends three key components to effectively embracing “Agile” in your marketing efforts. Think “outline”, not “campaign”. While this is in essence still a campaign in that it has a clear objective, multiple moving parts and will need to deliver results, Harvard Business Review contributor Jayson DeMers recommends that you avoid plotting your campaign in so much detail that you can’t change it. The whole point of being agile is being able to adjust to new information and data points. Starting with a broader outline allows you to do this. Start small. Start with a modest plan and become more ambitious as you gain momentum. The whole point of Agile is to test, iterate, test, iterate — if you start off too big, you’re investing in collateral that you haven’t tested yet. Start small, run with it, analyse your results. Iterate. In addition, if a more attractive medium comes along, or if an unexpected obstacle interferes with your campaign, you can make adjustments before you’ve spent too much money. Take breaks. Pause frequently to re-evaluate your position. Create milestones in your loosely defined outline, and pause each time your reach one. Remember, this is not such a detailed plan that it cannot be changed. The whole point is that you can constantly adjust it. Review the effectiveness of your current efforts, particularly lead generation. Determine what changes have occurred in your environment (including new competitors, technologies, or trends), and then tweak your strategy. Following an outline doesn’t mean that you shouldn’t draw on customer research. Data is critical to the process. However, you need to leave room for growth. Map out your starting point in as much detail as you want, just make sure your plans are easy to adjust based on how well the first milestones in your campaign perform. The more you’re able to test your marketing messages and then adjust them, the higher your chances of delivering a message that resonates with your customers. You need to be responsive, quickly ditching what doesn’t work and doubling down on what does. That’s what generates leads and maximises market share. Collaboration over silos and hierarchy. Ultimately, Agile Marketing is focused on speed, predictability, transparency and adaptability to change. If you can embrace — and implement — these values, you can harness the power of Agile Marketing (and its lead generation results) in your business. Would you like to increase your lead generation by up to 40%? Inside B2B Lead Generation 2019 is a white paper and interactive webinar researched and produced by Digital Kungfu, a purpose-built lead generation company for tech businesses. Matt Brown is the Chief Excitement Officer (CEO) of Digital Kungfu, a storytelling production company that helps technology businesses generate leads, market their software products/service and build their brands. He is also the founder of The Matt Brown Show, South Africa’s favourite podcast for entrepreneurs.